Thirty-four years ago the fire sprinkler industry witnessed something never seen before – the first commercial installation of a CPVC fire sprinkler system. The system was a BlazeMaster® CPVC fire protection system. The installation was at the world renowned Fontainebleau Hilton Resort, which has often been described as the crown jewel of Millionaire’s Row on Miami Beach with its 920 grand rooms and more than 50 suites. Over the years, the Fontainebleau has been home to movie stars and has been visited by every American president since Eisenhower. Films shot on location include Goldfinger, Scarface and The Bodyguard. Its magnificent image is enhanced with such special attractions like a 7,000 square-foot Octopus pool with its 240-foot water slide. Other amenities include a state-of-the-art fitness center, three whirlpool baths, a shopping arcade, business center and 190,000 square feet of meeting space. In the first installation, the decision to go with a CPVC fire sprinkler system amongst all of the resort’s other luxury, upscale products was an innovative move by the hotel owner and the fire sprinkler contractor. Metallic systems were the standard choice in the industry at that time, but ongoing problems with corrosion and other job site challenges associated with metallic pipe mandated that a better option be chosen. Since the early 1980s when BlazeMaster CPVC was introduced as the first listed and approved non-metallic fire sprinkler system for NFPA light hazard occupancies, many things have changed—but not everything. Fontainebleau is still a noteworthy, well-respected destination spot, and BlazeMaster CPVC Fire Protection Systems continue to deliver a more reliable, cost-effective system. The property owners of Fontainebleau were so pleased with how successful the first installation was that they specified BlazeMaster CPVC as the fire sprinkler product of choice for the brand new Fontainebleau hotel/condo project. Known as Fontainebleau Tower (or Fontainebleau II), the 36-story residence addition was completed in 2004. The decision to repeat the use of a BlazeMaster CPVC Fire Protection System came from both the hotel’s owner and its developer. But no one probably agrees with that decision more than Enrique Suarez, Jr., the mechanical engineer at Hufsey, Nicolaides, Garcia, Suarez Associates, Inc. (HNGS) responsible for the engineering and design work at the new Fontainebleau Towers. “BlazeMaster CPVC is becoming the accepted norm in the engineering design community… it is definitely used throughout major light hazard projects in this region more than metal,” said Suarez. BlazeMaster CPVC pipe and fittings will never corrode. In addition, they are 100% immune to microbiologically influenced corrosion (MIC). This benefit ensures a more reliable, maintenance free system, making it a preferred system among engineers. "In South Florida, there is a lot of concern about corrosion, especially near the beach where the Fontainebleau projects are both located," said Suarez. "The concern starts already during construction, when the pipe is exposed on the job site to the humidity and the salt air atmosphere." Economics was also a major factor in the decision to install a CPVC fire sprinkler system for the prestigious Fontainebleau Tower. "Cost is one of the biggest problems with steel systems," said Suarez. "You hear about it from all of the contractors. And with prices of steel nearly doubling in the past year, there is even more reason to go with BlazeMaster CPVC. We’ve seen a tremendous growth in its usage in this region. There is hardly an instance where a BlazeMaster system is not specified." Other benefits that made Suarez and his company supporters of using a BlazeMaster CPVC system include ease and speed of installation. Because it is a cemented joint system and the BlazeMaster CPVC piping is somewhat flexible, it can be attached directly to a concrete ceiling. With steel there is a threaded pipe and screwed fitting, which requires a split ring hanger dropping from a ceiling. This limits the finished ceiling height. Suarez also liked that the pipe could run in return air plenums. And, since BlazeMaster CPVC pipe and fittings have less friction loss than steel, contractors can reduce the pipe size being used. For all of these reasons, BlazeMaster CPVC was the material of choice for Fontainebleau 34 years ago and it is the material of choice today. BlazeMaster CPVC fire protection systems are approved for more applications than any other non-metallic system. 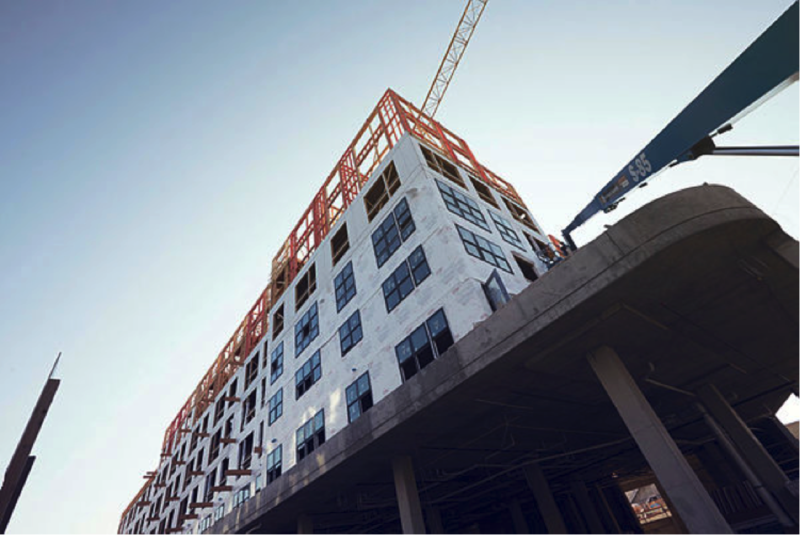 High-rise building owners can rely on its ease and speed of installation, cost savings, proven corrosion resistance, lower environmental impact and superior performance. To learn more or schedule a time to discuss capabilities, contact one of our piping systems consultants.